MANILA, Philippines – Despite a double-double performance, Renaldo Balkman and the San Miguel Beermen fell in the hands of the Alaska Aces, 105-103 on Saturday, May 19 at the Lamberto Macias Sports Complex in Dumaguete, Negros Oriental. It was 5 years ago when PBA fans first saw NBA veteran Renaldo Balkman in the Philippines. The Puerto Rican - American’s first tour however, didn’t come to a good end as he was slapped with a lifetime league ban after choking Arwind Santos, his Petron Blaze Booster teammate. Balkman was forgiven and the perpetual sanction was lifted up just couple of months ago. 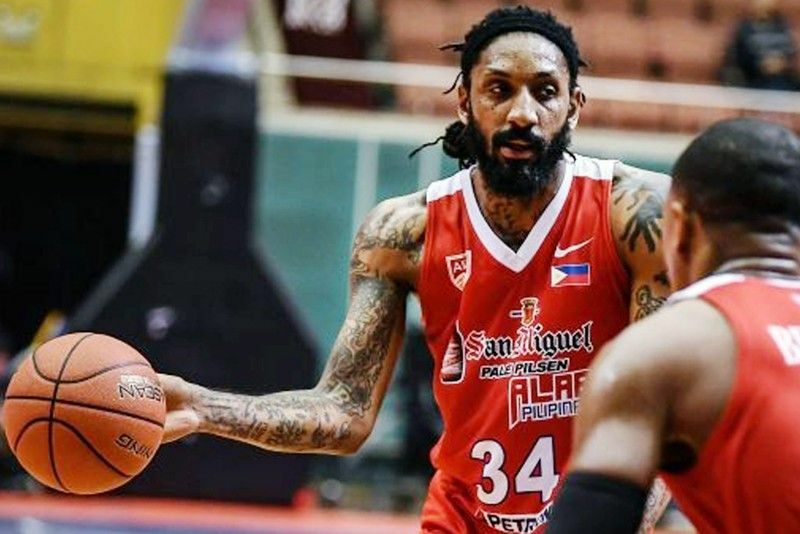 Today and moving forward, all eyes are fixed at Renaldo Balkman as he vowed to redeem himself and settle the “unfinished business” with the San Miguel Beermen. The former New York Knick opened the new chapter of his PBA career with a flawless drive at the 10:11 mark of the opener. But the Alaska Aces got a hot head start and owned the Beermen with a 11-2 advantage. Way back in the ABL, Balkman is a well-known and respected import stopper. Name it, the 7’5” Sam Deguara of Mono Vampire Thailand found it difficult to get pass the 6’8” Renaldo Balkman. Same thing here in the PBA, Balkman managed to draw Aces’ import Antonio Campbell’s 3rd personal foul with over 5 minutes remaining in the 1st quarter. After the first 12 minutes of his comeback game, Balkman made a passing grade with 9 points and 2 rebounds while trailing the Alaska Aces by 8, 28-20. Renaldo didn’t start the 2nd period. Instead, 2017 top draft pick and Balkman’s tough opponent in the ABL, Christian Standhardinger played the 4-position and chipped in significant digits to catch up with Alaska. Standhardinger’s 11 markers and Balkman’s presence midway of the second didn’t do much for San Miguel as the Aces still had the lead, 57-43. In one play, Renaldo Balkman attempted to attack the rim from the middle, but the seldomly-used Mario Magat humongously rejected the power forward and converted it into a deuce off transition. Balkman looked gassed out as he started the 3rd quarter, Instead of sprinting, he just jogged his way down from one end to another while catching his breath. Aside from being exhausted, Renaldo missed most of his free throws which are nothing but wasted opportunities. Alaska’s lead had gone up to 22 but San Miguel slowly narrowed the gap and brought the lead down to 9 at the end of the third, 81-72. Despite the poor start, Balkman recovered and jotted down 21 points along with Standhardinger’s 17. It was winning time for San Miguel at the final canto of the game. Renaldo Balkman looked to finish with a 30-point game in his homecoming. From as high as 22, the Beermen managed to level the game at 103 with less than a minute remaining. Balkman had the chance to win the game but he accidentally turned the ball over to Alaska that paved a way for Vic Manuel to beat the buzzer with floater to wrap up the game in favor of the Aces, 105-103. All in all, Renaldo Balkman was pretty impressive in his comeback game despite the loss. Balkman recorded a game-high 32 points and 13 boards in his 2nd tour of duty with San Miguel.